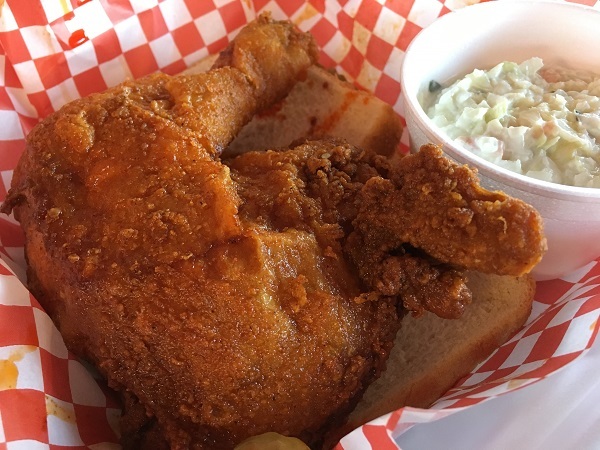 Helen’s Hot Chicken, Nashville TN – Marie, Let's Eat! For the third stop on our day trip to the Music City, I did something silly. I pulled up our map of restaurants we’ve visited and selected a neighborhood we have not visited before, and then looked for the most promising place for a snack. Hot chicken is always very promising. After our two stops for lunch, we spent a few hours shopping at some of our favorite places around Nashville. The Great Escape in Madison has always been a reliable place to find gifts and treasures, and I was sorry to leave a few temptations on the shelves. (We did have a moment of confusion when we realized the store had left its decades-old home for another place in the same strip mall!) From there, we took the “top loop” of Briley Parkway over to the west side of town and found some more treats at the local McKay, including a few movies that we’ll watch with our son for our Fire-Breathing Dimetrodon Time blog when he is a little older. Coming back east into town, we stopped in the Fisk University neighborhood for a snack at the first brick and mortar store for a local chain, Helen’s Hot Chicken. They started selling chicken and fish from a no-frills trailer on Rosa Parks Blvd in 2008. They opened this store in 2014 and have been selling franchises as well. At present, they have one location outside Dallas TX, one in Clarksville TN, and a total of five around Nashville. Store # 8 is coming to Murfreesboro TN and # 9 to the town of Portland TN, which is on I-65 just below the Kentucky line. I’ve only had hot chicken a few times, and still haven’t quite got around to spending a day trying several places. So I’m no authority, but I was very pleased with this. I ordered the hot – there is a meaner level called “hella” – and it was right at the limits of how much I could bear to eat. The chicken was really juicy and the skin was crispy and it was just a little bit painful. We lucked into arriving when we did. Hot chicken is cooked to order and so guests usually will wait for 15-20 minutes, or more, for their food. But by chance, the kitchen had just got somebody else’s order slightly wrong and they were able to get my snack out to me almost immediately. The people at the tables around us didn’t seem to give me any shady eyes while they continued their waits. Again acknowledging my limited experience, I really did enjoy this more than I did our visit to Hattie B’s a few years ago. The cashier was really friendly, and the chicken was good. 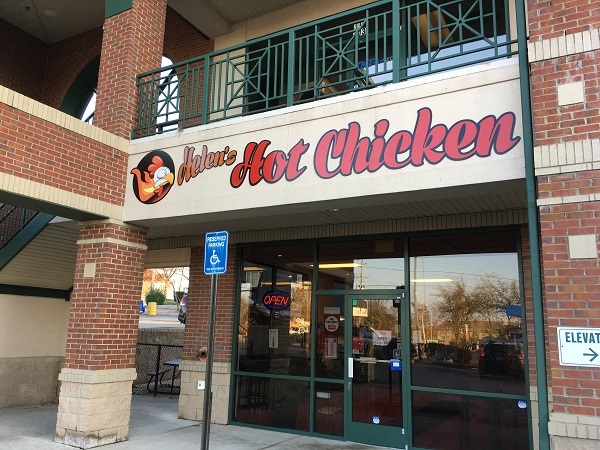 I’d be happy to visit again sometime… once I’ve been to a few more hot chicken places, anyway. Posted on January 20, 2017 by Grant G.Posted in chicken, local chains, nashville, tennesseeTagged chicken, hot chicken, local chains, nashville, tennessee.